BioSENIOR helps maintain the intestinal lining and supports digestive health by promoting healthy immune, thyroid, pancreatic, and metabolic function. How Do I Know If My Dog Is Ready For A Senior Product? Dogs reaching the age of six or seven would be considered at the beginning of those senior years. Just like us they age at different rates and some are more active and do not look like seniors on the outside. However on the inside the digestion and absorption of nutrients begin to decline around the age of five. As our pets age the cells in your dogs body loose the ability to recycle their energy source, contributing to a slower recovery from day-to-day wear-and-tear. So if your dog isn’t as energetic and active and their appetite isn’t as good as it was these are signs of aging. They may have digestive issues, poor bowel movements (constipation or diarrhea), muscle loss, a poor coat, inflamed gums, joint issues, allergies or vision loss. If they are required to be on a protein rotation diet the intestinal lining of your dog is in need of repair. All of the above would be signs of aging that could begin even much earlier than five years of age and will only contribute to advanced aging. What Sets BiologicVET’s BioSENIOR Apart From Other Senior Products On The Market Today? BioSENIOR uses an anti-aging strategy for animals five years or older needing a metabolic lift or for convalescing animals requiring recovery support. BioSENIOR was designed to improve the ability of the cells to recycle their energy source, adenosine triphosphate (ATP). As our pets age, ATP is recycled at a slower rate in the cells and this, in part, contributes to a slower recovery from daily wear-and-tear. BioSENIOR includes ingredients that improve ATP status of the heart muscle, neural network, and skeletal muscles. Energy enhancement is immediately noticeable, and the body is better able to keep up with maintenance of tissues and important hormones. 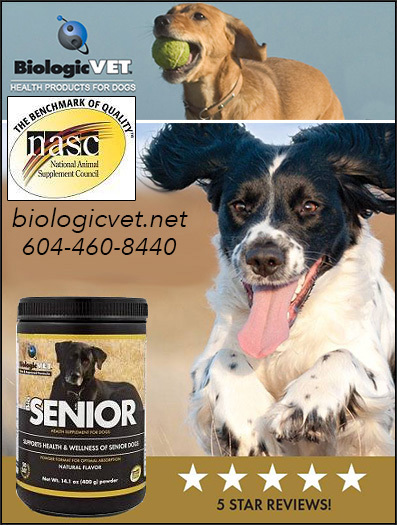 The BioSENIOR formulation is designed to support a healthy heart, mental alertness and acuity and muscle energy. This formula additionally improves hydration and muscle tone and strength, BioSENIOR supplies specific amino acids (l-glutamine, l-cystine and l-taurine), methylsulfonylmenthane, digestive enzymes (bromelain, papain, pancrelipase-standardized to contain lipase, amylase and protease) to facilitate nutrient digestibility and the building of muscle. These nutrients support the muscle mass to prevent the destruction and premature atrophy of the tissue, including the intestinal lining. In addition, the formulation includes creatine, coenzyme Q10, antioxidants – grapeseed extract and kelp, plus chromium and biotin that support heart health, gums, cognition, and muscle strength. The foundation of BioSENIOR is a certified organic lignan-rich prebiotic blend of defatted flax, sunflower and sesame seed fiber which supports healthy immune and metabolic function. The free-form base ensures an improved delivery of nutrients, facilitating greater use of the active ingredients, both in the BioSENIOR and in your preferred brand of raw, dry or moist pet food. In addition to the concentrated therapeutic levels of active ingredients, the powdered BiologicVET base is rich in prebiotics and lignans. Prebiotics feed the naturally present healthy gut flora (good bacteria) in your pet’s lower gastrointestinal tract. This encourages flora population and facilitates nutrient bioavailability; at the same time, limiting unhealthy bacteria and yeast overgrowth. Not only do prebiotics improve your pet’s digestive health, it improves their immune function. What Are Lignas and Why Are They Important To My Dog's Health? Lignans are naturally occurring phytoestrogens (plantbased hormones). They function as antioxidants and are converted into enterolactone and enterodiol (mammalian lignans). Their role is the control of normal hormonal balance and function, especially helpful when an animal has been spayed or neutered. BioSENIOR turns back the clock! What Do Dog Owners SAY About BioSENIOR? ‘BioSENIOR is a wonderful product that I use and trust for my 2 year old Pug x Beagle cross. Rosco was diagnosed with Gastro-Intestinal disorder about 6 months ago. After the vet suggested prescription drugs, I did some research and was not happy with this ‘band aid fix’. It was also recommended to put him on a big brand vet recommended diet, however, I am not satisfied with the processing of the food or the ingredients for that matter. Make sure your dog has a healthy body and mind with BioSPORT Today! We welcome your calls and would like to hear about your dogs! We look forward to your call and invite you to call us today!